"Now who gon' stop me? Who gon' stop me, huh?" Kanye West, our favorite ladies blouse and leather skirt-wearing rapper, took to the stage at Revel in Atlantic City last night wearing his weirdest stage costumes yet. The "Cold" artist gave concertgoers a chilling performance dressed in all-white, including outrageous headpieces like this crystal-encrusted Maison Martin Margiela mask. 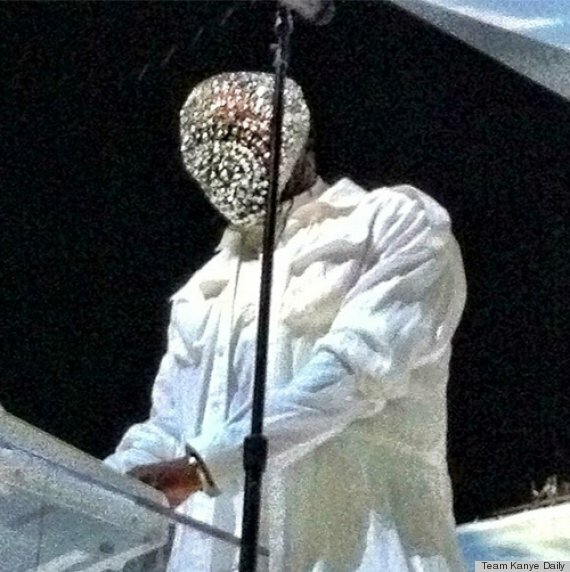 Always one to take it to the NEXT level, Mr. West changed outfits during the show and returned wearing a feathered mask that was quite fitting for his winter wonderland set. Top that, Lady Gaga!